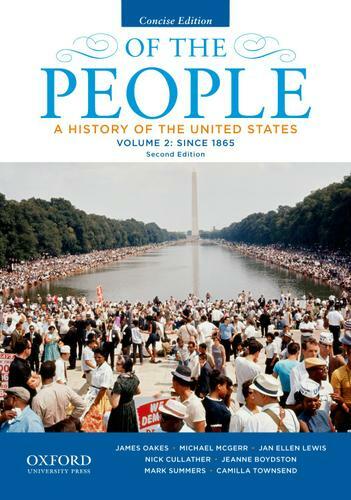 Of the People: A Concise History of the United States, Second Edition, not only tells the history of America--of its people and places, of its dealings and ideals--but it also unfolds the story of American democracy, carefully marking how this country's evolution has been anything but certain, from its complex beginnings to its modern challenges. This comprehensive survey focuses on the social and political lives of people--some famous, some ordinary--revealing the compelling story of America's democracy from an individual perspective, from across the landscapes of diverse communities, and ultimately from within the larger context of the world. The Concise Second Edition tells the same great story, but with fewer words and images. Maintaining the structure, the features, and maps of the comprehensive edition, this concise version has been thoughtfully condensed--paragraphs now contain trimmed sentences and a reduced number of examples--thus leaving the book's core content and compelling narrative unchanged. The second edition includes 75 percent fewer margin quotations and 60 percent fewer images than in the comprehensive edition.